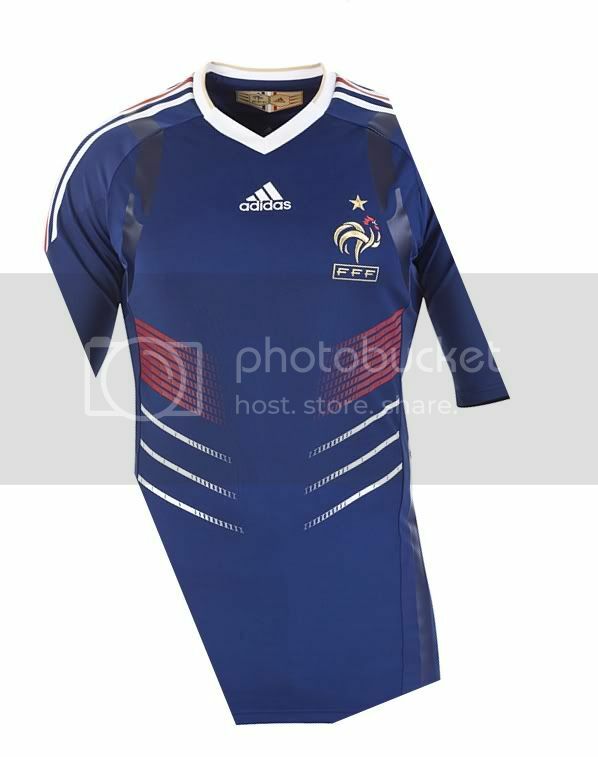 Here is a look at the new France shirt for the 2010 World Cup. Les Bleus ( the likes of Anelka, Henry, Gourcuff and co.) will wear this jersey at the 2010 FIFA World Cup in South Africa. France finished runners up at the 2006 World Cup, and qualified for the 2010 event in somewhat controversial circumstances, eliminating the Republic of Ireland with a “La Main de Dieu” ( Hand of God) goal. The new France football kit has been made by Adidas, which has outfitted the national side since the 1970’s. Click here to buy the France World Cup shirt from reputed online retailers Kitbag. The V-Necked shirt uses Adidas’ Techfit Technology. The new France jersey has red and white stripes on the sides. The strip made it debut in France’s first leg World Cup 2010 Qualifier against the Republic of Ireland. The shirt is paired with white shorts and red socks. Have a look at the photo of the new France soccer shirt.